Two turntables, a camera, a video projector, two mics, a screen. Those are the parameters for the series Plattenspieler, in which for almost 10 years author and music journalist Thomas Meinecke has invited various partners to talk about music and everything associated with the act of listening. Each guest chooses a handful of records to play during the evening, as does the host Thomas Meinecke. 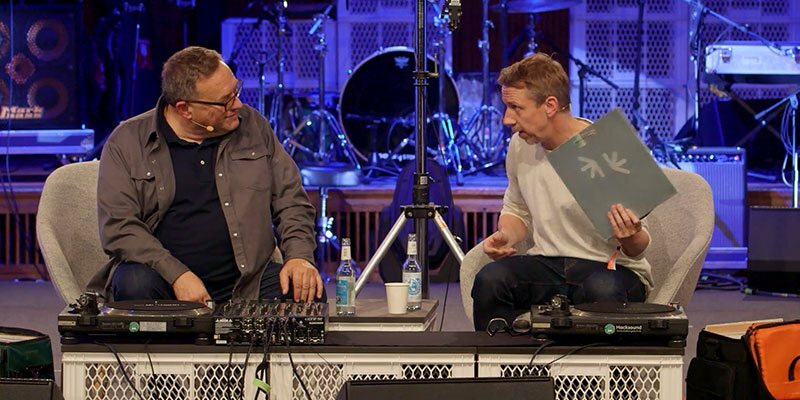 Meinecke’s guest for this episode of Plattenspieler, filmed at Loop, is Gilles Peterson. An avid record collector, curator, music producer and record label boss, Gilles Peterson is perhaps best known as a radio presenter on Saturday afternoons on BBC 6Music and as an international club DJ. In the video below Gilles Peterson plays and discusses a selection of tracks that had a major impact on him. The music ranges across decades and continents and takes in Brazillian pop music, Nigerian high life, American jazz, British drum and bass and more.